There were few speeches and not even many questions at the General Assembly that convened on June 8, 2011not just because the newly elected moderator, the Rev. Danny Olinger, urged new commissioners to watch and learn for a few years, nor just because we were celebrating the seventy-fifth anniversary of the founding of what was to become the Orthodox Presbyterian Church. There was a sense of maturity based on the grace of God, whose works in weak vessels were lauded throughout. We could see God's hand at work in the OPC, reminding us of what the apostle Paul says in Philippians 1:6, "He who began a good work in you will bring it to completion at the day of Jesus Christ." In Quebec City we speak la belle langue, French. I minister almost entirely in French. However, English is an open door through which we can reach out to the community with the gospel. It is a joyous time for me at this seventy-fifth anniversary. The church that was founded by some one hundred and thirty members on the eleventh of June 1936 has held fast to the commitment it made on that memorable day until this memorable day. Have we maintained the faith? Have we been building the church? Jesus said, "I will build my church." Whatever we have done to land here seventy-five years later, holding to the same faith, has been by the grace of the Spirit of the living God. The OPC Timothy Conference is a ministry of the Committee on Christian Education conducted through its Subcommittee on Ministerial Training (SMT). Its purpose is to challenge young Orthodox Presbyterian men in their late high school and early college years (ages 16-21) to consider the gospel ministry as God's calling for their life. 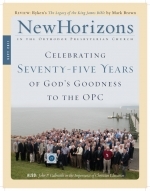 Instituted in 2008, the conference was conceived by Dr. David VanDrunen as a means for helping the churches of the OPC identify young men with potential gifts for the ministry.